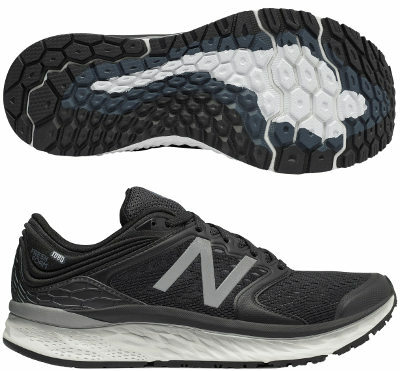 New Balance Fresh Foam 1080 v8 are neutral cushioned running shoes. The premium New Balance Fresh Foam 1080 v8 keeps development of flagship material (third edition featuring Fresh Foam in midsole) offering plush cushioning, softer feel and smoother response at unfortunately high price. There is a lot of competition in premium segment to reach the second position after the Asics Gel Nimbus 20 and based on moderately successful figure sales from smaller sibling Fresh Foam Zante v3, many potential buyers would consider the Fresh Foam 1080 v8 as running shoe for long distances and daily training. There are not many but interesting changes compared to its predecessor Fresh Foam 1080 v7. Molded foam collar and reinforced heel counter increase stability keeping everything in its place while bootie construction provides not only superb comfort but also prevents chaffing. Default insole is a top quality ergonomic one from renowned manufacturer Ortholite® but can be replaced by custom orthotics. Typical lateral logo from New Balance is made of reflective material to increase visibility under poor light conditions. Major change in Fresh Foam 1080 v8 is difficult to identify at a glance because it concerns to midsole's geometry and few details are visible from outside. As a result of mentioned changes, Fresh Foam performs better with softer feel and more uniform response while keeping the well-known 8 mm drop. Outsole goes one step forward keeping transversal grooves including several spaces for enhanced flexibility in the forefoot but hexagonal lugs change size and shape depending on the area to adapt better in different gait phases, providing good traction although not as great as in Fresh Foam Hierro v2.